It is more than gratitude what we feel every time an award notification arrives in our email box and we feel deeply honoured when your reviews are uploaded in the popular travel portals sharing the experience of their stay in Ira Hotel & Spa. Season 2017 was no exception and this is the perfect opportunity to say to every single one of our visitors a huge thank you for both awards and amazing reviews. Let us now be a little more specific. 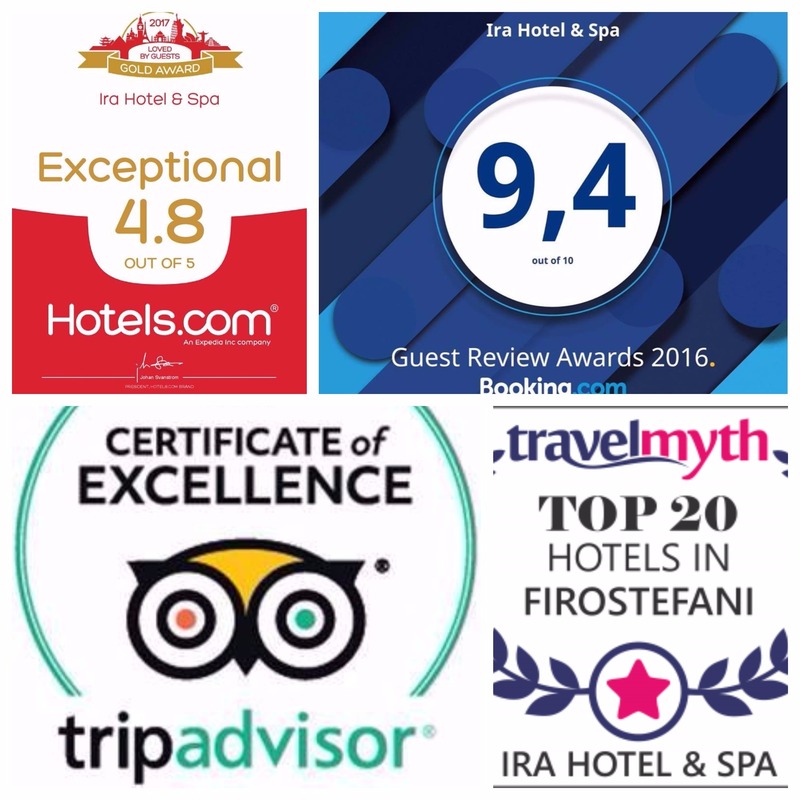 The season started with a higher score than any other year to the renewed booking engine #booking.com where Ira Hotel & Spa scored a 9.4 out of 10 after the reviews of guests booked from this site. Then travelmyth.com included Ira Hotel & Spa among the top 20 Hotels in Firostefani, Santorini. From the website #hotels.com and of course thanks to your wonderful reviews, Ira Hotel & Spa received an amazing 4.8 out of 5 for their experience. Last but not least comes the Certificate of Excellence for the 6th year in a row from tripadvisor.com. In addition and for the first time #Trip_Advisor honoured Ira Hotel & Spa with a Green Leaders Award! As for your reviews that we look forward to hear all about and the evaluation of your experience and our efforts are available at www.booking.com and for Trip Advisor at https://www.tripadvisor.com/Hotel_Review-g635607-d314487-Reviews-Ira_Hotel_Spa-Firostefani_Santorini_Cyclades_South_Aegean.html.